Glyn High-Tech Distribution have partnered with MobiApps, a provider of satellite and hybrid terrestrial technologies for commercial communications. MobiApps deliver transceivers that combine satellite communications and a GPS receiver on a single chipset. MobiApps also converge wireless communications technologies such as 802.11, GPRS, CDMA, and satellite to provide global communications capabilities at a low marginal cost, allowing clients to deploy advanced communications products across a number of industrial applications. Among MobiApps’ product range, Glyn High-Tech Distribution are promoting their satellite transceivers such as the m10 satellite data modem. The m10 OEM transceiver provides worldwide satellite data transmit and receive capabilities for asset-tracking and industrial remote communications. The m10 OEM transceiver operates with the ORBCOMM low-earth orbit (LEO) satellite network, providing global coverage with no blockage. ORBCOMM are a global satellite data communications company, focused on M2M communications. ORBCOMM satellite network provide low cost, reliable, two-way data communications services around the world through a global network of low-earth orbit satellites and accompanying ground infrastructure. The system can send and receive short messages, between six bytes and several kilobytes, in near real-time, allowing users to access critical information readily, often from areas beyond the geographic reach of terrestrial systems. It can improve asset utilisation by allowing automated monitoring, tracking, and management of fixed and mobile assets around the world. Possible application areas for MobiApps satellite transceivers include remote asset tracking, utility monitoring, mining, agriculture, livestock management, water management, military and homeland security. The m10 OEM transceiver is suitable for high volume applications equipped with a controller requiring only low-cost satellite communications. Its two-chip revolutionary design includes the analogue devices, BlackfinDSP and MobiApps' m1375 RF module, creating a fully integrated satellite transceiver, ready to connect serially to an application processor. Additional field-proven features make the m10 OEM transceiver suitable for managing and monitoring remote and mobile assets. Developers and system integrators can leverage the m10 OEM transceiver low operations. 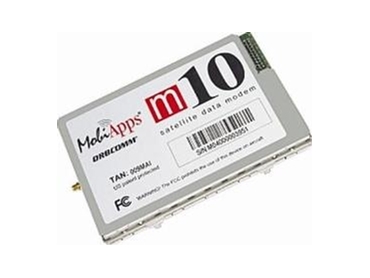 Other MobiApps ORBCOMM satellite transceivers include the m100 and m200. The m100 satellite transceiver has additional features such as a GPS receiver aside from the MobiApps ORBCOMM RF module while m200 satellite transceiver has additional interface like CAN bus.